The actual event of the discovery of silver has been lost in time. However, modern-day archaeologists surmise that silver was already in use among humans around 3000 BC. Ancient civilisations like the Incas, Greeks and the Egyptians held silver in high esteem and used it for the creation of a number of artefacts from religious idols, jewels, and coins. Infact, the three metals, all of which are elements, known to ancient humans were silver, copper, and gold. The ancient Egyptians were able to separate silver and gold by heating the metals with salt. Later humans started separating silver directly from its ore. This technique was prevalent in Europe as well as in ancient India, China, and Japan. It is now believed that it was from these ancient times that silver was used as a form of money. An interesting fact is that silver was dearer than gold in Egypt well up to the 15th century BC. We can only speculate that perhaps that’s where silver investing started. The Greeks were mining around 30 tonnes annually by the 7th century BC. The economic stability of the Roman Empire was heavily dependent on silver bullion, which came from conquered territories like Spain. Believe it or not, the Romans hit a peak production of 200 tonnes annually, and 10,000 tonnes of silver was already in use within the Roman occupied territories by the second century AD. Needless to say, this was an unprecedented event, and it’s hard to understand how the Romans hit those volumes with the technology that they may have had in that era. Clearly, those are volumes that we would hit using the modern machinery of our times. By the time the Roman Empire was finished, tens of thousands of tonnes of silver had already been mined and used up. As only a finite amount of silver exists on the planet, supplies had already started being depleted. By the 18th century AD, much of the silver extraction action had shifted to another continent – South America. The Spanish stepped up mining operations and some of the countries like Argentina were named after Argentum, another name for silver. Silver’s foray into coinage started around 600BC in Lydia, a kingdom from Asia Minor. Coins minted in silver include the Drachma, from Greece, The Roman Denarius, The Dirham and the Indian ‘Mohur’ from the Mughal Empire. Presumably, the culture of silver investing took off around this time. Governments had always observed that the price of silver tracks gold, so a gold-silver parity was set. This ratio was set at 12.5: 1 in the Roman Empire. The US set this ratio to 15:1 in 1792. France actually set this ratio to 15.5:1 in 1803. Meanwhile, silver was being used widely across the world for coinage and in the 1400 -1500s several countries across the world were using the precious metal for coinage. People, therefore, started investing in silver coins for its value. Spanish silver coins were being transported to Asia by sea. These coins were traded for porcelain, silks, spices and other desirable goods from Asia. So, now we can see where the perception of value relating to silver started building up. The demand for silver also rose during the Renaissance, as it was used for fine craftsmanship. It was around this time that the European nations used a lot of silver to mint coins. As a result of this new demand for coinage, there was a huge influx of silver into Europe, which ultimately led to inflation. Why was silver a popular metal for coinage? 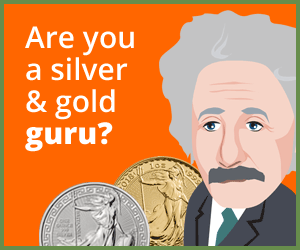 Let’s look at the reasons why silver was a great choice for coinage. Firstly, silver and gold are dense metals. Having a high value to weight ratio is an advantage, as high value coins don’t need to be huge and bulky. It is easy to divide silver into smaller parts, without eroding its value. You can make coins straight out of a bar or melt coins back into bars. The density and high value-weight ratio make silver products convenient to transport. The purity of silver can be easily established. Very pure silver is denoted as having a purity of 999.9. Since it has a universally accepted price, the metal is fungible. ‘Fungibility’ means that one piece of silver can be traded unequivocally for another. A 1oz coin is exactly the same value as another. It does not decay and is considered to be highly durable. This makes it a great choice of metal for coinage. Since it has lesser value than gold, it is great for small transactions. However, it wasn’t until 1979 that really serious silver investors emerged. The Hunt Brothers, Nelson, William and Lamar, sons of the millionaire Texan oil tycoon, H.L. Hunt tried to corner the silver market by amassing 100 million troy ounces of the precious metal and drove the spot price of silver up from $11 in September 1979 to $50 in January 1980. Eventually, intervention by the US government stopped the bull-run. the back of the US debt ceiling crisis. Standard & Poor, the global rating agency based in the US released a negative outlook on the “AAA” rating of the United States economy on April 18, 2011. By the 25th, silver traded at $49.80 on the COMEX, as investors scrambled to pull their money out of the US economy, and turned to precious metals in order to hedge. Physical Gold is a reputed online silver broker and precious metals investment advisory firm. Our investment advisory team has precious metals experts who rely on their years of experience and expertise, when it comes to giving sound advice to investors, just like yourselves. Call us now on 020 7060 9992 or get in touch with us online to discuss your silver investment goals.